Sun kissed delight with sensational views! A symphony of Mediterranean warmth and classical appeal. Revel in breath taking views whilst entertaining family and friends on the superb patio overlooking a shimmering pool set in a tranquil paradise. The sweeping driveway will welcome you home past magnificent trees and fuchsia coloured bougainvillea. The curved double front door opens into a glamorous entrance hall and luxurious receptions, including the formal lounge and dining plus family room. An upstairs entertainment area with a built-in pub flow out to the balcony with exquisite mountain, vineyard and garden views. The beautifully appointed open plan kitchen has a central island with a breakfast bar; gas hob, double oven plus a separate scullery. The five luxurious bedrooms are all en-suite. The separate pool room is a perfect space for entertaining; with a built-in drinks' server, sauna, bathroom and patio with built in braai and al fresco dining area. Triple garaging space plus ample paved parking and Borehole add to the convenience of this attractive home set in a stunning setting. Conveniently near to top schools including the American International, Reddam House, Herzlia and Constantia Waldorf. Enjoy magnificent surroundings, parks, Sunday drives to nearby beaches, gorgeous green belt strolls / cycles and wine estates with signature restaurants, including Constantia Uitsig, Groot Constantia, Beau Constantia, Klein Constantia, Steenberg and Eagles Nest. 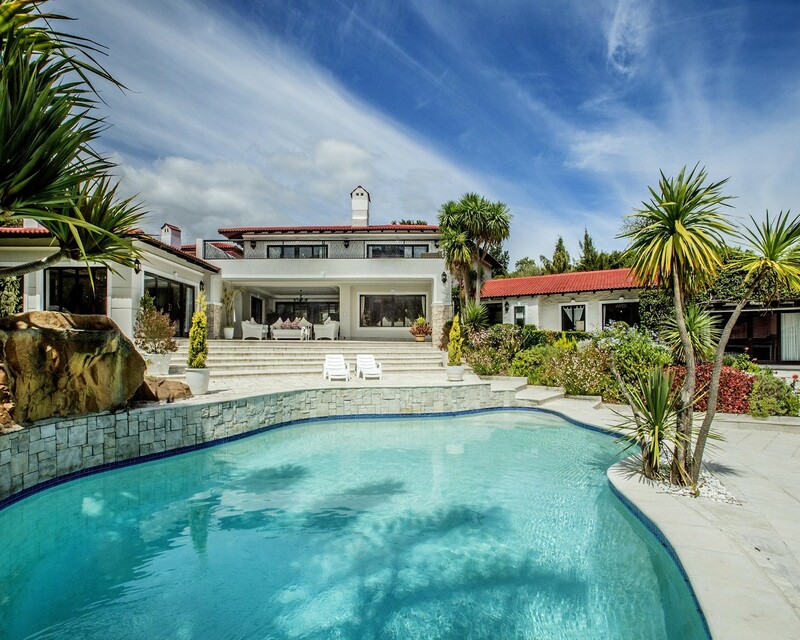 Centrally located with easy access to the CBD; Cape Town International Airport; Constantia and Steenberg Village Shopping Centres, Cavendish and Blue Route Shopping Malls; Virgin Active Gym and Constantia sports grounds.